Niki Lauda is a living legend. The Austrian race car driver has three Formula One championships to his name, and he’s considered one of the all-time greats. Immortalized as the foil to James Hunt in the motion picture “Rush,” he is more known to race fans for driving for March, BMR, Ferrari, Brabham, and McLaren. He also had a memorable stint in a special Mercedes-Benz, and that specific car is now for sale. The car is quite remarkable to all fans of early DTM racing. It’s a 1984 Mercedes-Benz 190E 2.3-16v that Lauda raced at the Nürburgring back in 1984. This wasn’t a simple spec race between a few random drivers, mind you. The 1984 Nürburgring Race of Champions was held to celebrate the opening of the new Grand Prix circuit at the ‘Ring. Juan Manuel Fangio was on hand to handle vintage-car driving duty, while Hermann Lang trotted out an original Silver Arrow race car. The treat of the day, however, was the race organized by Mercedes-Benz to show off its new sport sedan. The race included such greats as James Hunt, Sir Stirling Moss, Alain Prost, and Jack Brabham doing battle in race-ready four doors. The winner was a young Brazilian driver named Ayrton Senna. Lauda finished right behind Senna to claim second. 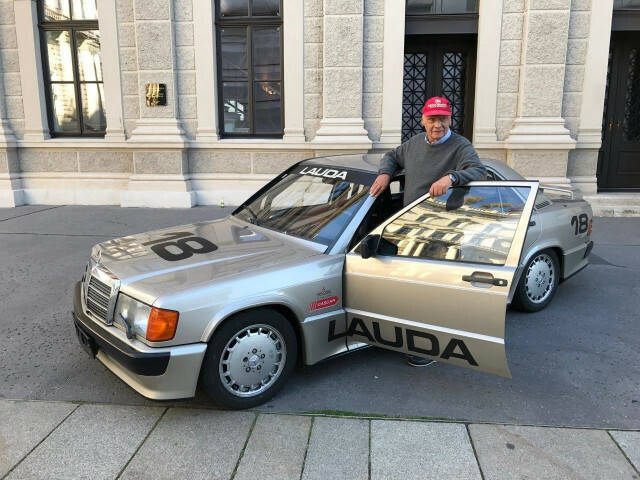 The car Lauda is now for sale on Autoclassics.com. While the listing has no details, the car appears to be in good shape considering its age and how it was used. No price is listed, either. If you want to know how much it’s going to cost to acquire this one, you’ll need to call the dealer in Germany. Our guess? Well, an Evo 2 version of the 190E is worth more than $200,000 these days. This one was piloted by an all-time great driver at an all-time great circuit against other all-time greats. The price will be at an all-time high for a 190E Benz.